Check out these birthday party entertainers in MO. From clowns to ventriloquists to stilt walkers and more, these entertainers will show your guests an amazing party! 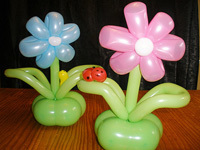 Check out these Missouri balloon twisters and be amazed at what they are able to create. 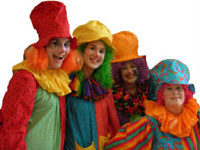 They are the perfect entertainment for your child's party, with the ability to entertain for hours. Check out Missouri's best party entertainers in this guide that we have created just for you! When you have one of these entertainers you will definitely have an exciting party. 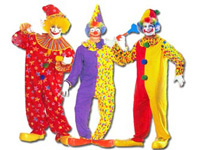 Check out this guide to the best Missouri clowns to hire for your events. They will keep all of your guests laughing all party long! Nothing captures our imagination like the theater. Bring it to life for your next birthday entertainment needs with a kids' puppet show. We have a list of puppet shows for birthday parties in Missouri. 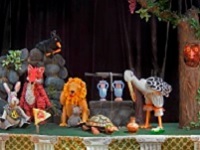 Watch as your kids sit quietly and cheer and clap for these spectacular birthday puppet shows. You might even crack a few smiles by the final curtain call. What better way to delight your child then to invite Santa Claus over? If you need to hire a Santa in Missouri check out our list. These Santas are sure to bring the spirit of Christmas to your next holiday party. Looking for a new kind of performer? How about stilt walkers in Missouri? These gentle giants are sure to bring some surreal fun and smiles to your child's next party. 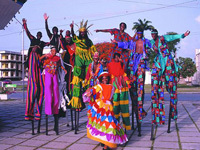 Check out our list of stilt walkers for hire in Missouri. Take birthday entertainment to a higher level, literally.